My pizzas just keep getting better, if I do say so myself. Now that I have the method down I am not making them so often, and when I do make them, I am looking for something different from the usual tomato, garlic, olives-plus that I make most often. 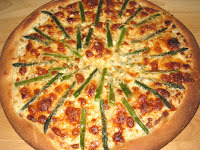 My forays into different styles have had mixed results, in particular my attempts at a white pizza. It has been hard for me to find the right sauce to use, and then to use the right amount of it. 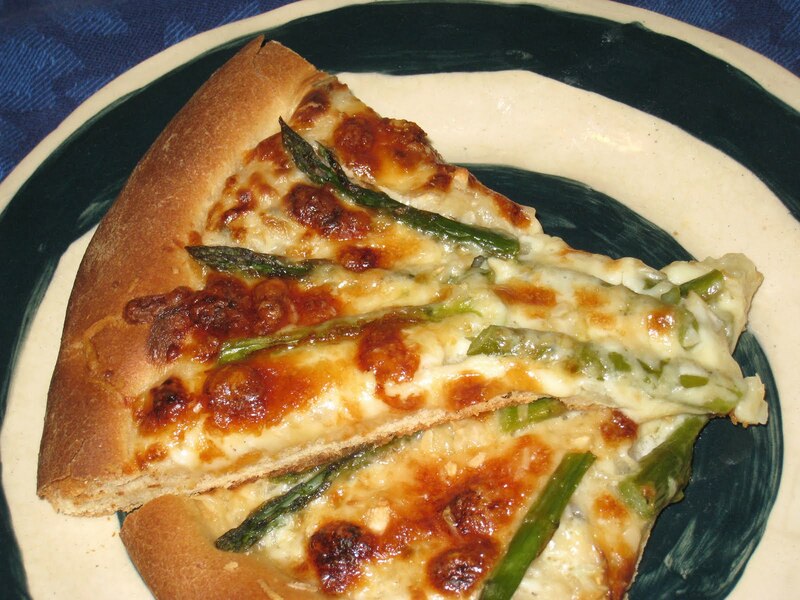 Two things made this pizza the best of my non-traditional varieties. One is the way I made the dough; the other is the white sauce. 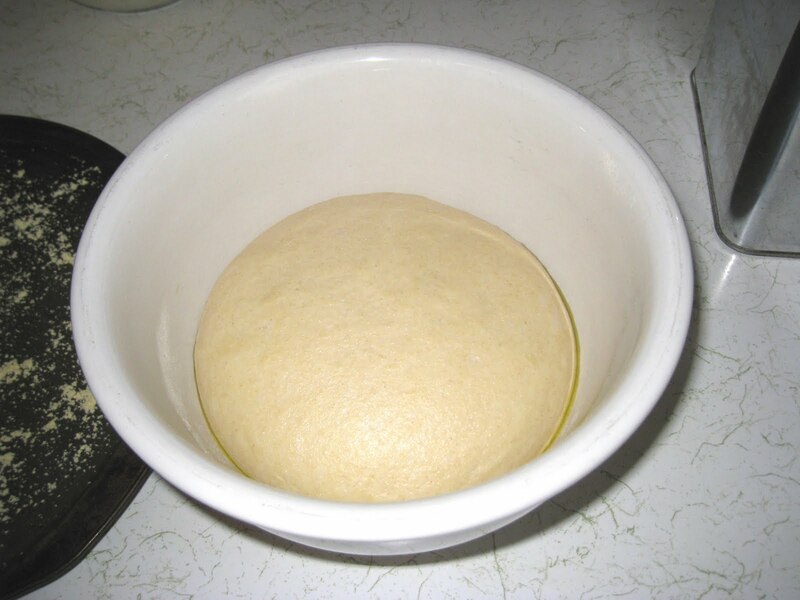 Let's start with the dough. The picture doesn't even begin to do justice to how soft and smooth it was after rising. I could not get the thought of babies' bottoms out of my mind as I admired this before turning it out to make the pizza. I think I might have even kissed it (is that so wrong?). It was smooth and shiny and I could tell just by looking at it that it was going to be the smoothest dough I've ever made. And it was. It had a more dense, crispier texture than my usual crusts, without being as hard. All this time I thought it was the white whole wheat flour that was making my pizzas on the stiff side, but I think it might be how I was making it. What made the difference this time was that I paid much more attention to how much bench flour I was adding as I was kneading the dough. I don't like to have a lot of mucky stuff on my hands, and wet dough definitely falls into that category, so I have a tendency to keep adding flour until the dough does not stick to the palms of my hands at all. This time, I monitored it closely and stopped adding flour as soon as it stopped clumping onto my palms. It's a fine distinction, but the best way I can describe it is that if I move my hands quickly enough, then I can get free of the dough without it sticking, but if I move them more slowly it will stick. As soon as I reached this stage, I stopped, whereas in the past I would have kept adding more flour until it didn't matter how fast or slowly I kneaded the dough, nothing would stick. And that, I think, is what made this dough so good. What made the pizza so good was the sauce. I started with a basic white sauce and added a few items that were subtle in and of themselves, but enhanced the overall flavor. And they were simple ingredients - onions and fennel seeds. I sauteed them in olive oil before adding the roux and then took it from there. The result was most satisfactory. I think I have finally nailed the white-sauce pizza with this one. It was not too saucy, not too dry, and the fennel seeds gave it a bright burst of flavor without being overpowering. 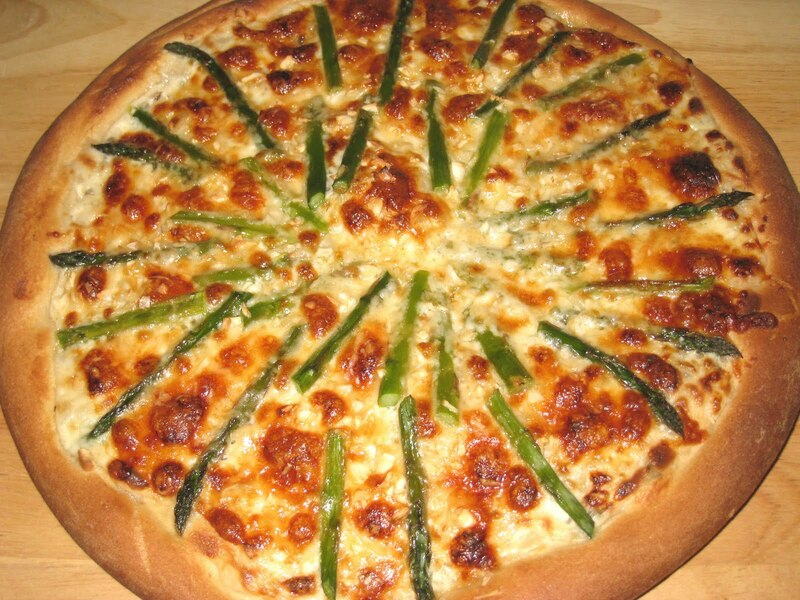 It worked beautifully with the asparagus I had on hand (In season! Yay! ), but it would work just as well with any vegetable. To make the pizza, spread the white sauce over the dough. Add a light layer of mozzarella cheese, then spread out the asparagus, or whatever vegetable(s) you are using. I also added minced garlic, of course. After that comes a light sprinkling of Parmagiano Reggiano. Bake at 475 deg. F. for 20 minutes, or until the crust is golden brown and cheese is bubbling. For my latest go-to pizza crust go here. If you're new to roux, here's the recipe for the white sauce. Add flour and stir well to coat the onion and fennel seeds. Cook for 2 minutes but do not let it brown. Add the milk, stirring constantly to prevent lumps. Season to taste with salt and pepper. Without raising the heat, let the sauce come to a boil. Lower the heat and cook until the sauce has thickened and coats the back of a spoon (run your finger through the sauce, and it should stay on the spoon on either side of the "line" you have created). If sauce gets too thick, add milk in small increments to make it thinner.